I lived with my grandparents, mom, and sister as a teenager. On most nights, we would sit down as a family for dinner. One of the meals, my grandma would prepare is green beans, potatoes, and ham in the crockpot. I can still see the kitchen and her round crockpot full of the green beans, potatoes, and ham. We would either have it with bread and butter or a simple salad. Whenever I cook something from my childhood, I try to tell my boys about it. The Imaginative One was five when my grandma died. During the last year of her life, they became so close. This is a way for him to have memories of her. When I made this, the potatoes were at the bottom of the crock. So when Hubby looked into the crock all he saw was green beans and 1 piece of ham. He was nervous about what we were having. Once he saw the potatoes, he was relieved. He enjoyed the meal. Place enough water in the crockpot to cover the food. 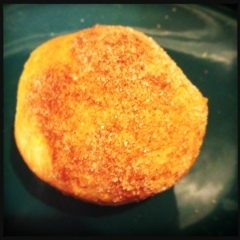 I found this recipe last week and tried it out on my family. They all have their seal of approval. In fact, I’ve been asked to teach a lesson on it on Easter Sunday. The crescent rolls represent the robes Jesus was wrapped in & the tomb he was put into after he died on the cross. The melted butter represents the oils put on Jesus before he was put in the tomb. The sugar represents the sweetness of God in your life. The cinnamon represents the bitterness in life. You need both the sweetness and bitterness. Dip the marshmallow in the melted butter, coating all sides. Dip the butter coated marshmallow in the cinnamon sugar mixture. Wrap the marshmallow in a crescent roll. Seal the ends. Repeat with the rest of the crescent rolls. 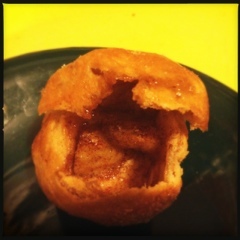 Place in a muffin tin sprayed with cooking spray. While they bake, the marshmallow melts leaving the inside hollow just like when Jesus rose from the dead. The tomb was empty. 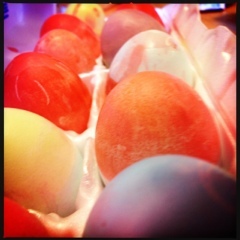 I found this “recipe” for egg dye that I thought was a great idea. The Wee One has been pestering me to allow him to dye eggs. He doesn’t eat any though. It’s easy and smells great. 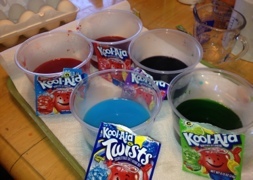 All you need is Kool aid packets and 2/3rds cup of hot water. That’s it. Make sure you have the surface you are using covered up with paper though. It can stain otherwise. We put paper towel down on a tray so there was less mess. The Wee One can make a big one. Oh the grape flavor comes out dark so add a little bit of berry blue to it. And the pink lemonade comes out too light so use a little bit of cherry with it. 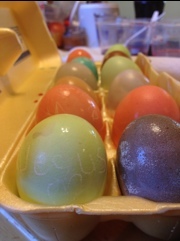 Use a white crayon to create designs on the egg before dunking it in the dye.